These are not the kind of dry, cakey brownies that you can pick up and eat on the go, or take away. 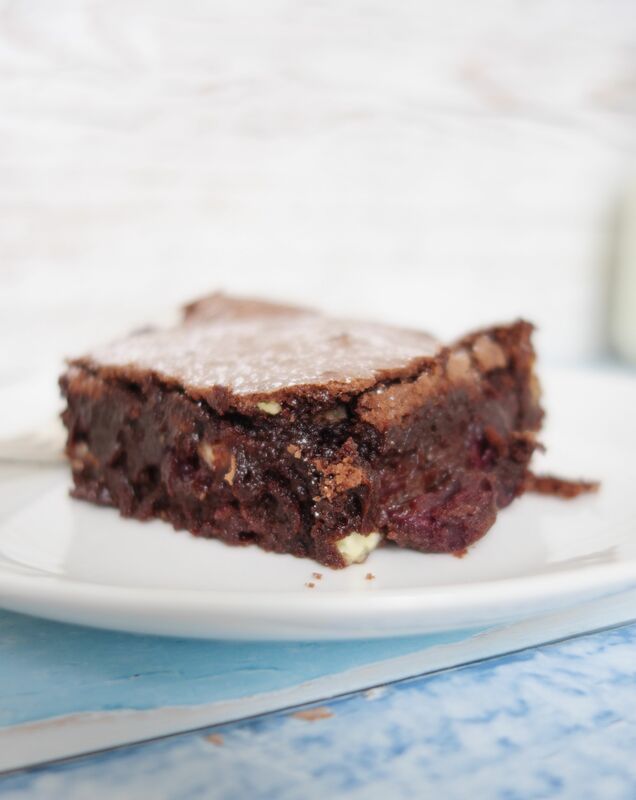 These are oozy, gooey, chocolatey brownies for savouring – better served with a fork or spoon to help you navigate your way through the decadence (unless you don’t mind getting very chocolatey fingers)! With cherry season approaching, I’ve added a generous sprinkling of delicious fresh cherries for that classic combination. Despite not looking like much, these brownies are also rich enough to serve as a dinner party dessert, with a dollop of crème fraîche on the side. If you’ve read a “A Handful Of Flour”, you may know that I’m not a fan of making things gluten-free just for the sake of it. The dish has to be delicious in its own right, rather than a poor man’s substitute. 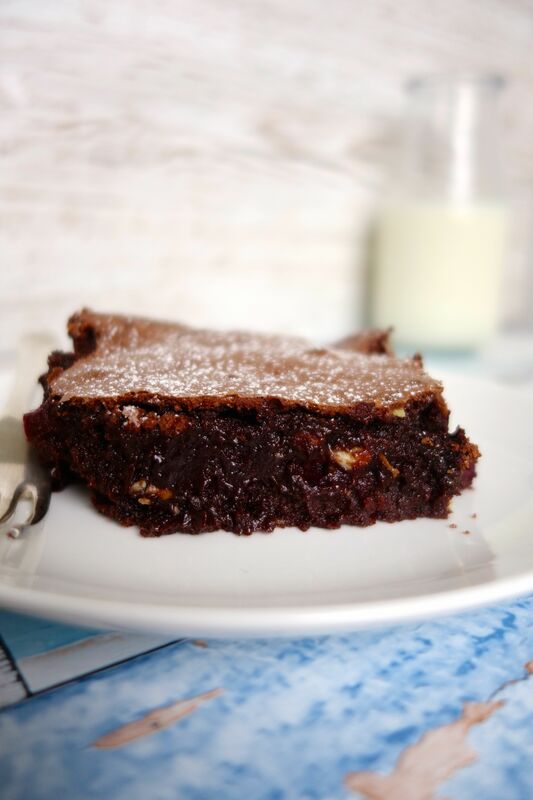 In this instance, you will find nothing second rate about these brownies – the brown teff flour works wonders to create the richest, softest brownie base, with edges that are just chewy enough. 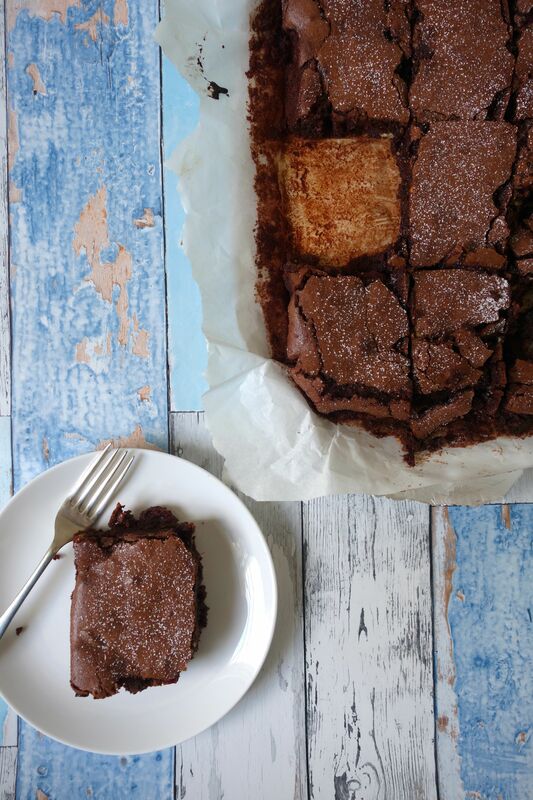 If you prefer your brownies a little less gooey, leave them in the oven for an extra 5-8 minutes for a firmer texture. For those of you who don’t like white chocolate, you can always leave the chocolate chunks out, or substitute an alternative variety. I used our Shipton Mill brown teff flour, milled from the whole teff seed for a flour that is packed full of flavour. If you’re cooking for a coeliac, make sure the baking powder and chocolate that you use are also gluten-free – not all versions are. Start by removing the stones from the cherries and slicing them into quarters. Preheat your oven to 180°C, and line a 22 x 28cm baking tin with baking parchment. Place a heatproof bowl over a saucepan of barely simmering water on a low heat, and melt the chocolate and butter together in the bowl. Make sure the water does not touch the base of the bowl. Stir from time to time to combine the two ingredients, and then set aside to cool. In a mixing bowl, beat the eggs and salt together until pale and creamy using an electric hand whisk. Gradually add the sugar, beating all the time. Then beat the melted chocolate mixture with an electric hand whisk until it starts to lighten in colour. Using a spoon, gently stir the melted chocolate into the eggs and sugar. In a separate bowl, combine the flour and baking powder together using a hand whisk to distribute the raising agent evenly, then gently fold this into the chocolate mixture. Lastly, stir through the cherries and the white chocolate chunks. Pour the mixture into the baking tray and smooth out the top using a spatula or knife. Bake for 25-30 minutes. It should be set but still have a very slight wobble to it if you want them to be gooey. Insert a metal skewer to see whether it is cooked through – you want a moist crumb, not a wet batter on the skewer. Leave the brownies to cool and set in the tin before slicing. They will keep for up to three days if stored in the fridge in an airtight container. Storing them in the fridge also firms them up slightly.